Strolling through Olafur Eliasson’s remarkable Pentagonal Landscapes exhibition re-awakens the mind to the dynamic complexity of spatial experiences. 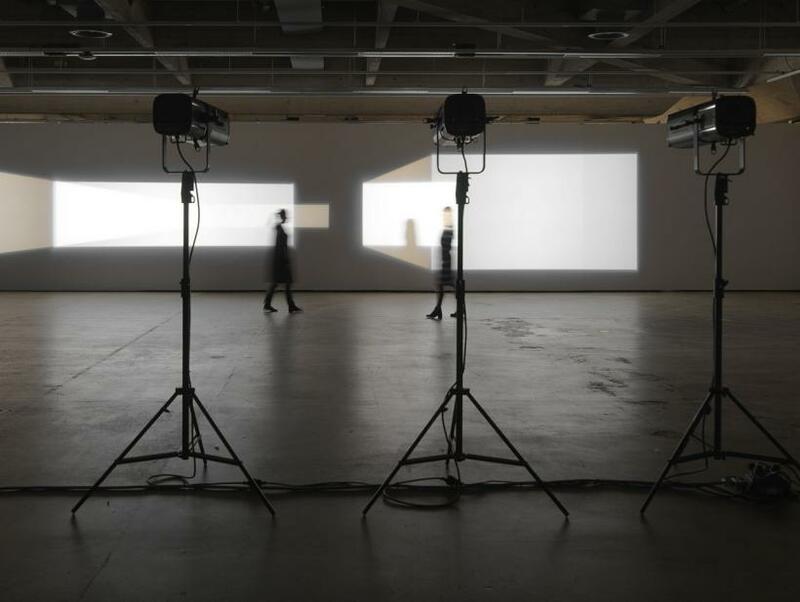 To accomplish this, Eliasson not only brings together a host of authentic and reflected vistas, but also convincingly manifests their fragmentary, confounding and, ultimately, ephemeral nature. 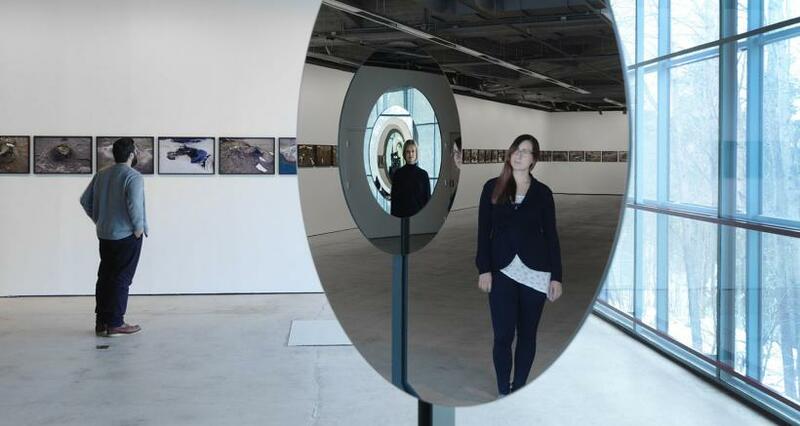 Moreover, the exhibition, which celebrates the Saastamoinen Foundation’s acquisition of the brand new ‘Pentagonal mirror tunnel’ – a work produced specifically for EMMA’s collection – presents a compendium of the themes Eliasson explores through his art. Comprising light, colour, optics, mirrors, navigation, architecture and landscape, their presence can be witnessed in each and every contribution, but they are, decidedly, most palpable in the newly acquired work. 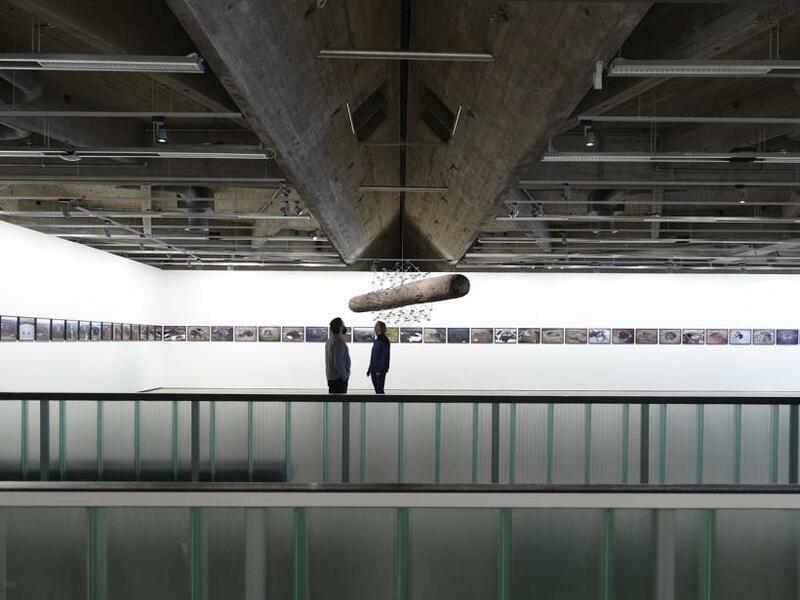 This isn’t immediately obvious from across the expansive gallery, since the five elements that make up ‘Pentagonal mirror tunnel’ resemble a circular cordon of road signs. 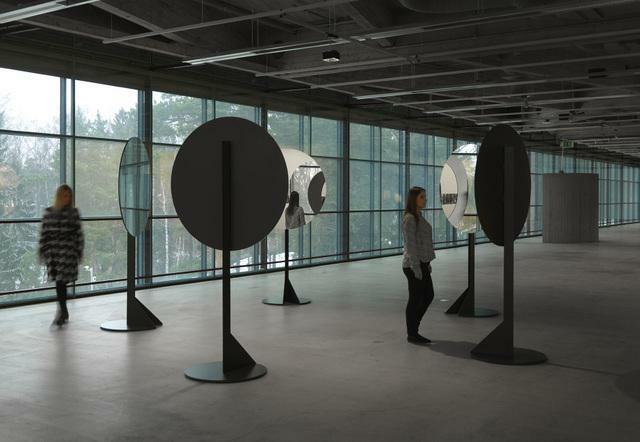 In actuality, the mirrors conform to the shape of the 5-sided figure and it is only when viewers are extremely close to the mirrors or step into the space between them that the visual intricacies created by this asymmetrical arrangement begin to unfold. Here they find themselves peering into elliptically shaped tunnels layered with reflections that provide glimpses of things located to their right, to their left and behind them. 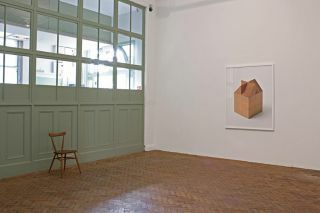 The work profoundly differs from other optically intriguing mirrored structures, namely Lucas Samaras’ ‘Room No. 2’ and Yayoi Kusama’s ‘infinity mirror room’. 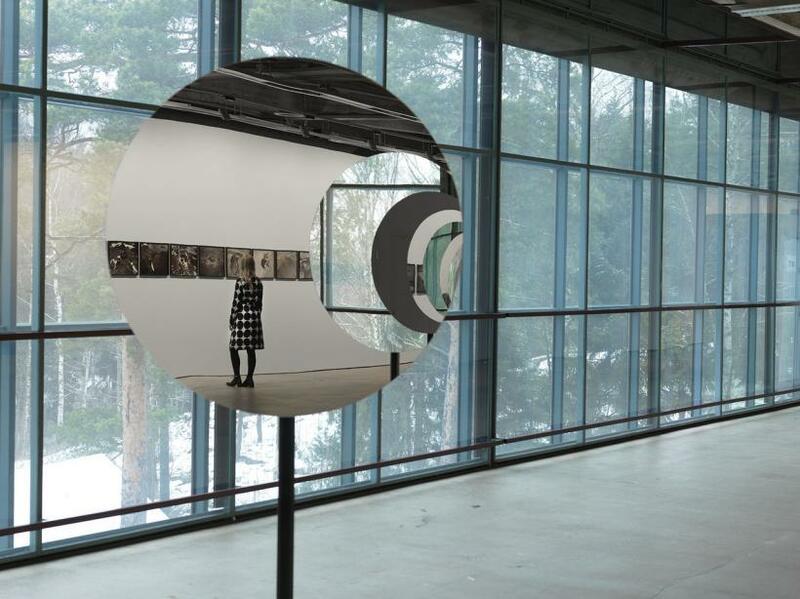 Unlike these enclosed spaces, Eliasson’s mirrors are not isolated within a gallery. The tunnels they devise not only condense the reflections of disparate features and direct them through these conduits, but they also appear to punctuate the exhibition space, which pulls us forward and into them in an attempt to better comprehend this simulated view. Some might dismiss this work as being too gimmicky – a clever science project done up as art – which I believe would be a misjudgement. An engaging playfulness suffuses the experience and the sculpture, in showing how visual data can be modified, transferred and layered, also urges us to scrutinise what it is we are seeing. The upshot being that it also modifies our understanding of the spaces we inhabit. Works such as ‘Remagine’ and ‘Innen Stadt Außen’ offer additional examples of the visual playfulness that marks the artist’s approach. 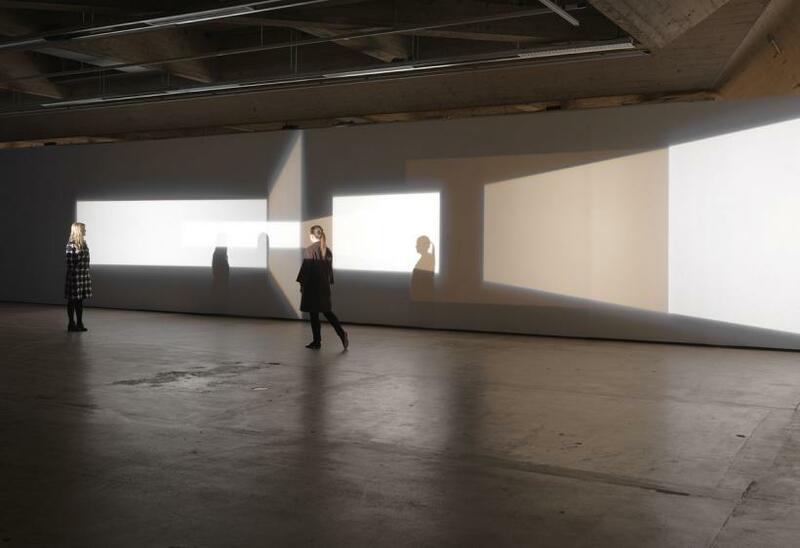 The former alternately flattens and deepens spatial illusions by projecting rectangles and trapezoids of white light onto otherwise bare museum walls. 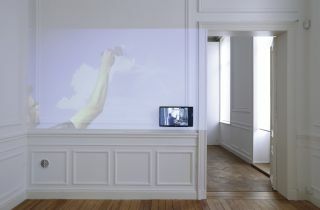 Visual disjuncture, created by filming the movement of a large mirror through Berlin’s streets, defines the latter. Eliasson balances these internal and urban perspectives with three extensive photo series documenting Iceland’s huts, volcanoes and hot springs, and the paradoxical sculpture ‘The Lost Compass’. The range and intensity of the colours and forms marking the earth’s surface in the photographs emphatically jettisons any assumptions of Iceland being a homogenous, sombre or altogether unremarkable place. And notions related to direction are similarly revamped in the compass piece. 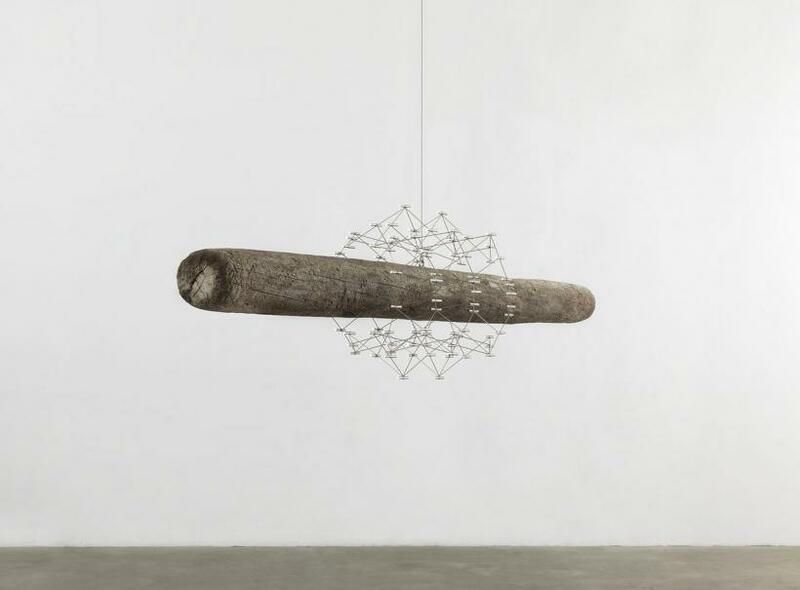 The metal framework delineating the cardinal points not only remains unlabeled, but it is also attached to a driftwood core. This work, much like the entire exhibition, embraces themes of happenstance and discovery, which, if one is open to new experiences, makes it so impressive.